WELCOME TO THE MARK MY HOUSE .COM WEB SITE. HERE YOU WILL FIND THE WORLD'S GREATEST HOME ADDRESS MARKER. 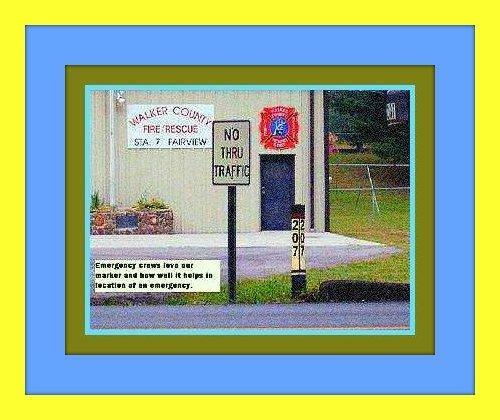 WE HAVE DESIGNED THESE MARKERS TO HELP COMMUNITIES "WITH RURAL ADDRESSES" MARK THEIR HOMES FOR EMERGENCY SITUATIONS,... AS WELL AS ANY SITUATION AT ALL. WE WORK WITH CHARITIES TO HELP THEM MAKE MONEY FOR THEIR CAUSES, SO PLEASE FIND A CHAIRITY AND PURCHASE A MARKER ON THEIR BEHALF.